The Excel Portfolio Optimization model calculates the optimal capital weightings for portfolios of financial or business investments that maximizes return for the least risk. The design of the model enables it to be applied to either financial instrument or business portfolios. Additional technical analysis indicators perform optimized back testing to establish the technical parameters required to provide the highest total return from signal trading. Ability to specify the number of units held in each product or business with support for long and short positions. Specify minimum and maximum constraints per investment for the optimized portfolio. Limit optimization to downside risk or semi-deviation below a threshold target return under the Sortino Ratio. Sharpe or Sortino ratio is coupled with analysis of the gain/loss profile under the Omega ratio. Intuitive graphical result display with Monte Carlo simulation, including probability analysis on specified target return level. Chart displays the efficient frontier analysis with ability to choose from preset or custom portfolio sets with risk and return profiles matching required investment strategies. Ability to run a rolling back test of periodic optimizations to evaluate the subsequent value added of optimization at incremental time periods. Detailed charting and analysis of back tested technical indicators including SMA, ROC, MACD, RSI and Bollinger Bands for maximum return on optimized signal trading strategies. Compatible with all versions of Excel for Windows as well as Excel for Mac as a cross platform portfolio and investment optimization solution. More resources for the Portfolio Optimization template including video, user manual and support can be found on the Excel Portfolio Optimization Template page. 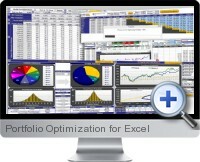 I have used the Portfolio Optimization template with data download Excel file. I have used other optimization tools prior to this and compared with the other optimization tools, the Portfolio Optimization solution is easy to use and yet very powerful. It has also intuitive graphical tools, which I have used for my documents that show optimization results. Using other commercial optimization packages was cumbersome to download financial data and convert into a predefined data formats. However, this Excel template is easy to download data from either Yahoo or Google Finance and they are ready to copy and paste directly to the optimization spreadsheets. It is so easy to use right away. Recommended both for educational and professional purposes. It is an excellent tool for equity investments. We used this program in my in my investment finance class and it made it very easy to see the best ways to create portfolios. I would highly recommend it due to the ease of use and the amount of information it gives you. This is the most powerful tool I have found in the market for constructing a portfolio. This spreadsheet provides an easy way to activate the data provided by Yahoo into a meaningful analysis of the market. I have been using Portfolio Optimization for almost four years now and I am quite satisfied with it for the cost.